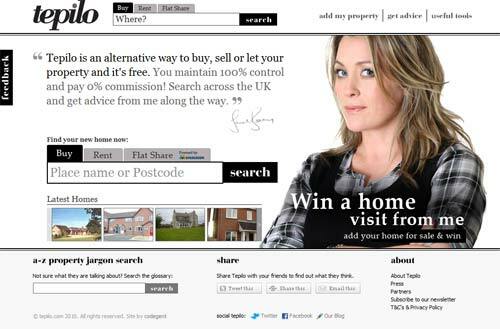 I came across Tepilo.com after following Sarah Beeny on Twitter. Tepilo.com is a very radical change in the way you can, buy, sell or let your home and came about during the 2009 recession. How many years have you heard sellers exclaim, we should of cut out the middle man. This is exactly what Tepilo achieves. It’s a platform to allow people to take control of buying and selling their own home, without the fees. The idea is you avoid paying commission to an agent and you have the ability to market your property without losing a sum. Tepilo.com enables you to market your property without the fees. Recovering from a recession, this has to be good news. Though RightMove.co.uk may not appear to have upfront fees, you will in effect pay for the privilege through the fees your estate agent charges on completion. With Tepilo there are no agent fees to pay. Look out for another challenger this year from Google. Why is it called Tepilo? Sarah Beeny tells us “My father had a fictional story about Tepilo castle which he used to tell me about when I was very young. It sounded like a wonderful, magical place and so I named the site after it, because we all aspire to live in our dream home”. If you are buying, selling or letting a property and want to avoid any agent fees in the UK. Yes, Tepilo is a logical move and it’s been tried before. Remember smove.com in the late 1990s? Both have one weakness which is this: owners manage the viewing process. The Tepilo content tries to tackle this (be careful, watch out, etc within its Safety Guidelines) but should vulnerable people really be showing strangers around their home? It’s this aspect of the Tepilo offer that unravels a bit when you look at it more closely. When selling using agents previously, I was shocked at the nuts the agents sent who were ‘supposed’ to be interested in buying, no addresses either and I had to do the showing round. Agents take no responsibility for who they send round to you house. A private seller can also ask for details from interested parties. I have a wonderful house to sell on Waiheke Island outside Auckland, NZ. Can I sell abroad thro’ your site?